It's more than double the price of Canon's EF 100mm f/2.8 USM Macro and Sigma's 105mm f/2.8 EX DG OS HSM, but this optic boasts an exceptionally wide maximum aperture for a macro lens. The Zeiss Makro-Planar T* F2 100mm ZE features a new optical design, although it takes advantage of ARRI/ZEISS Master Prime glass originally developed for cinematography, which Zeiss claims brings in a new standard for stills photography. The lens makes use of nine elements arranged over eight groups, and can be focused to a maximum reproduction ratio of 1:2. This means that the subject is recorded at half life-size on the sensor. It focuses from a minimum distance of 44cm up to infinity, while T* coatings are used inside to help reduce reflections, maximising the light that is able to reach the sensor, all the while minimising aberration such as ghosting and flare. 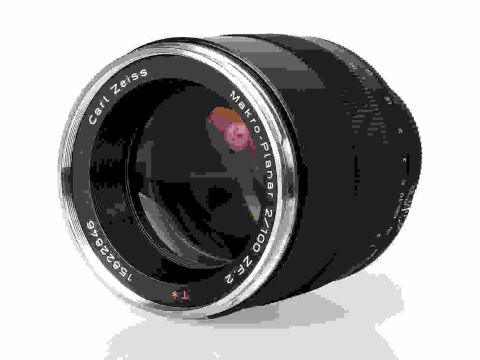 Zeiss has also incorporated floating elements to help correct for aberrations throughout the Makro-Planar T* F2 100mm ZE's range, such as spherical aberration, which is problematic at wider apertures, and distortion, which becomes increasingly evident at shorter focusing distances. The diaphragm, meanwhile, is formed from nine blades, each rounded to help produce circular bokeh. This is desirable when shooting wide open and wherever out of focus areas are rendered as a blur. The lens is currently available in both Canon and Nikon fittings, although it lacks an autofocus system so must be operated manually. No autofocus nor image stabilisation system means that there's no need for any switches on the barrel, and consequently, the barrel can offer a smart minimal design. At its base there's an aperture ring that travels between f/2-22, while above this lies a depth of field scale and focusing distances marked in feet and metres, as well as a reproduction ratio scale. It's a fairly weighty optic for its size, although considering its f/2 aperture and its largely brass construction, this isn't unexpected. Although part of the barrel is textured for the purpose of focusing, there's no ring as such, since the entire outer barrel rotates as this is turned. This action draws out the inner barrel as the lens focuses at closer distances, in contrast to most other macro lenses that focus internally. Despite this, the lens is designed so that its front doesn't rotate as it's being focused, which enables filters and other front-mounted accessories to be used with ease. Together with the material used in its construction, it's the simplicity of the lens' design that makes it feel solid and reliable, and ultimately the reason it's such a pleasure to use. Zeiss claims that the lens' large angle of rotation and precision mechanics enable it to be focused accurately, and in use this turns out to be the case. The former point, together with the weight of the glass inside, mean that the focusing action has perhaps more resistance than expected, but for more considered tripod-based work this isn't an issue. Only if you need to quickly move from one end to the other does it become a problem.